South African startup doot! 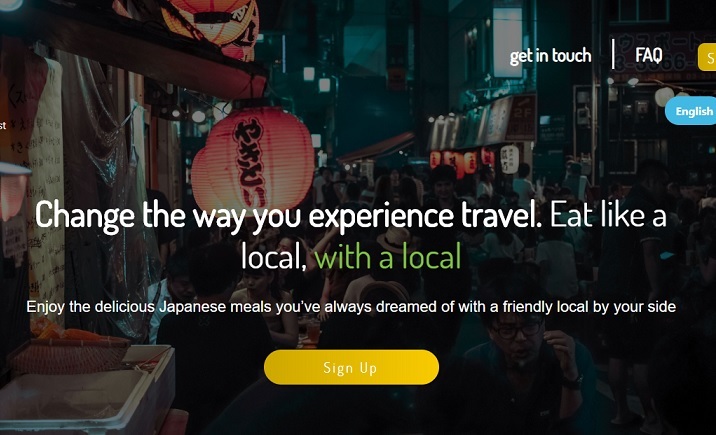 is a social travel marketplace that facilitates cultural exchanges by connecting Japanese locals and travellers together to meet at a restaurant, speak English and enjoy the local cuisine. Basically, users sign up to doot! and list themselves as either travellers or locals. Travellers list their nationalities, travel itinerary, the languages they speak, and what foods they would like to enjoy, while locals list the foods they would like to eat or “specialise” in, and their English level. Locals and travellers can then view one another’s profiles, which are displayed in a slideshow on the website, and send requests to one another. Once requests are made and accepted, a chat opens between the two individuals where they can agree on a date, time and place to meet. “At the restaurant, the traveller can expect to enjoy authentic food, avoiding the tourist traps, fully understand the menu, get insight into the local way of life, and have language barriers mitigated for them by the local. What some people may not know is that many Japanese restaurants – actually, many restaurants in Asia – don’t have English menus,” doot! co-CEO Brandon Josi told Disrupt Africa. doot! was initially launched in December of last year, with the model based around the traveller earning money for providing English conversation opportunity to the locals. It pivoted in the middle of this year, however, with Josi saying the new model has been far better received by both parties. Josi came up with the idea for the platform when travelling in Vietnam. “I often had Vietnamese people coming to speak to me and asking if I had eaten yet. I didn’t know why at the time, but it turns out they were trying to practice English with me. The more I looked, particularly in my year in Japan, the more I saw and experienced this,” he said. This was how doot! was born, and though the model has changed, the concept remains the same. The self-funded startup has taken part in the Y Combinator Startup School, and was recently accepted into the Japan-based 500Kobe accelerator. Since its launch, it has received over 100 sign-ups, and is planning on expanding this through paid marketing and on-the-ground marketing in Japan. “At present, we are following a slow launch plan. Since we are a marketplace, we only look attractive to the local side of the market when there are a large amount of travellers on the platform. So, we have been growing this amount with the aim of making it attractive to locals, knowing that it is likely that locals will sign up only when there is a likelihood that they can get their money’s worth out of doot!,” Josi said. So far, doot! is active in the Japanese cities of Kanazawa, Tokyo, Osaka, Kyoto and Kobe, with locals paying a monthly, quarterly or annual subscription fee to be listed on the platform, but it is planning future expansion to China, South Korea, Vietnam, Italy and India. “These are a few countries we intend to expand to in the mid-term, but there are many others in the long-term,” Kosi said.